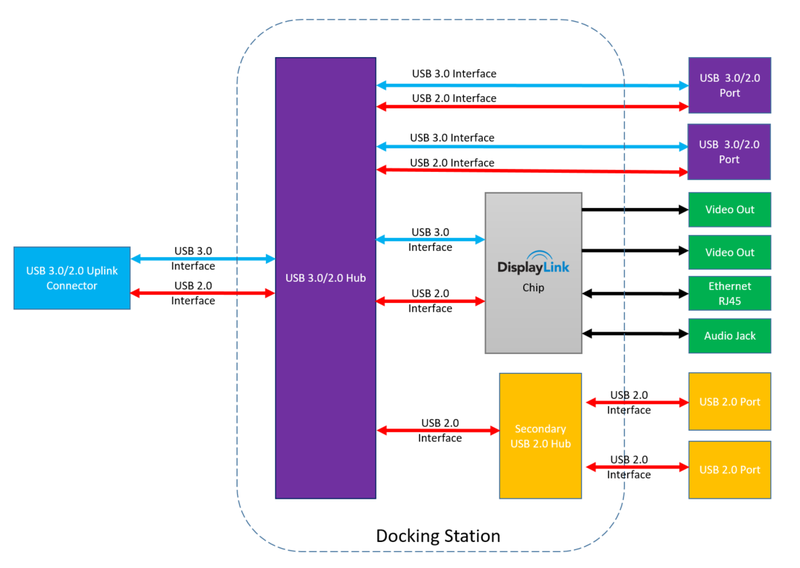 What part of the dock does DisplayLink support? If there is an issue with a device that is plugged into one of the dock’s USB ports this does not go through the DisplayLink chip and support must be sought from the manufacturer. The Chip sits on the USB 3.0 path but if the dock is plugged into USB 2.0 port will enumerate down to USB 2.0 speeds. Does the device behave the same when plugged into another computer? - This will confirm if the issue lays with the original computer or dock. Ensure all drivers are up to date. You may have an issue with the dock’s USB hub we would recommend contacting the manufacturer of the dock for hardware support. If there is no video output, please check your video cables. Does the device behave the same when plugged directly into the computer? Please check the configuration of the switch port, Half duplex connections, eg to network hubs, are not supported. A network link will not be established if connected to a half duplex port. The DisplayLink chip in the dock runs DisplayLink firmware. The firmware image must be digitally signed by DisplayLink otherwise the DisplayLink chip will not run the firmware. The firmware in the dock ensures secure communitcation between the dock and the host computer over USB or wireless. When a DisplayLink device is plugged into a computer, the host software checks the version of the DisplayLink chip firmware and if it matches the host software version, it just boots as normal. If the chip firmware differs, the host software upgrades or downgrades the firmware of the DisplayLink chip to match the version of the host software release. This way the firmware of the chip always matches what the driver release has been tested with to ensure compatibility and stability.